Gorgeous project .Thank you for sharing your project with us at the Crafts Galore Encore “Anything Goes” January Challenge. Good Luck and hope to see you again next month! Lovely project. So glad you joined us at A2Z Scrapbooking. Beautiful design, Nish. Thank you so much for joining us at Simon Says Stamp Wednesday Challenge. What a precious project, Nish, with delightful holiday options for decorating your home! Love it! Thanks for sharing your crafty project at the Moving Along With the Times Challenge Blog, and for supporting us. Please check back to see if you were one of the Top Picks. Leaving you with wishes for a wonderful day. It's beautiful, thank you so much for sharing at Ellibelle's Crafty Wednesday challenge! Such a beautiful project. Thank you for joining us for our 'Anything Goes' Challenge #1 at A Gem of a Challenge. Why not join our other other challenges at Polkadoodles and Digi Choosday. Beautiful creation, lovely design! Thank you for sharing with us over at The Creative Crafters. We hope to see you again. Thanks for sharing your creation with us at Your Scrapbook Place Challenge....Good Luck! 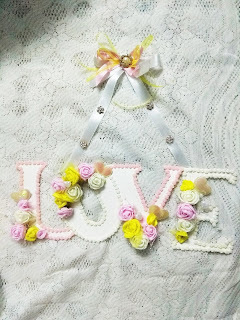 Very pretty, thanks for sharing your Love wall hanging...beautiful. Thanks for sharing with us at Double Trouble and The Paper Girls. Thanks for sharing your fabulous project with us in the Mix It Up Challenge Blog's January "Sentiment As Main Focus" challenge and we hope to see you again next month! Lovely project!! Thanks for joining in the fun with us at a2z. Such a pretty wall hanging, just love it! Thank you for sharing your beautiful make with us over at Polkadoodles Craft Challenge and hope you will join us again. Gorgeous! I love your project..so pretty.Thanks for joining us at Happy Little Stampers! Beautiful project. Thanks for joining us at https://polkadoodle.blogspot.com/ Good luck and I hope you'll join us again. The flowers are gorgeous and the pom pom trim adds great texture. Such a great decor piece. Beautiful creation. Love the idea. Thank you so much for entering our ATG challenge at Through The Craft Room Door this week. Looking forward to see you again next challenge. lovely!Thanks for joining us at creative friday.